Last Sunday I went to the New York Botanical Garden in the Bronx for its annual Orchid Show, which is usually held every March to third week of April. I've been going for several years now, my way of celebrating my Mom's beautiful spirit. We lost her one beautiful March day. It was already starting to snow when I arrived at the garden. 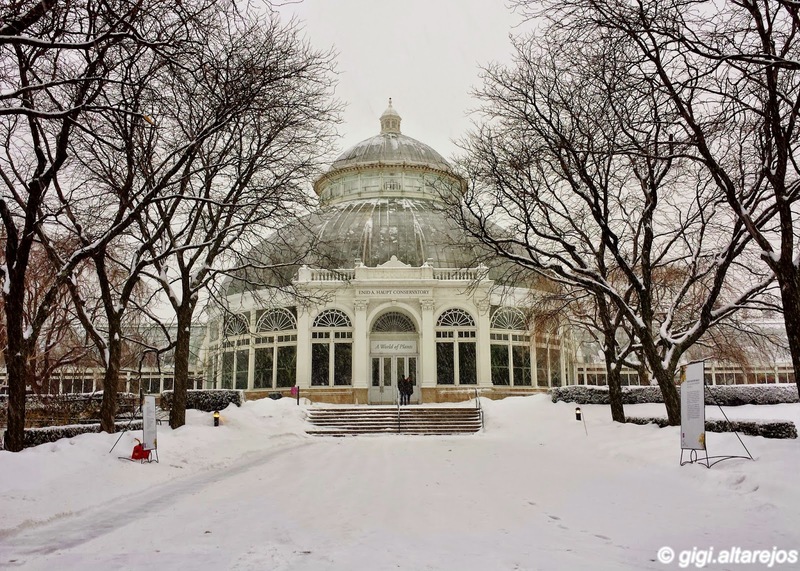 The orchid show is housed in the Enid Haupt Conservatory, it looked so pretty in the snow. The Conservatory also houses tropical plants and desert plants, and plants from the rainforests, among others. You have to go through all these displays before the main attraction. This year's Orchid Show has the theme "Chandeliers". The centerpiece of the show is a spectacular three-tiered flower chandelier that overflowed with the blooms. It was a hit with all visitors and I enjoyed seeing everyone's reactions. 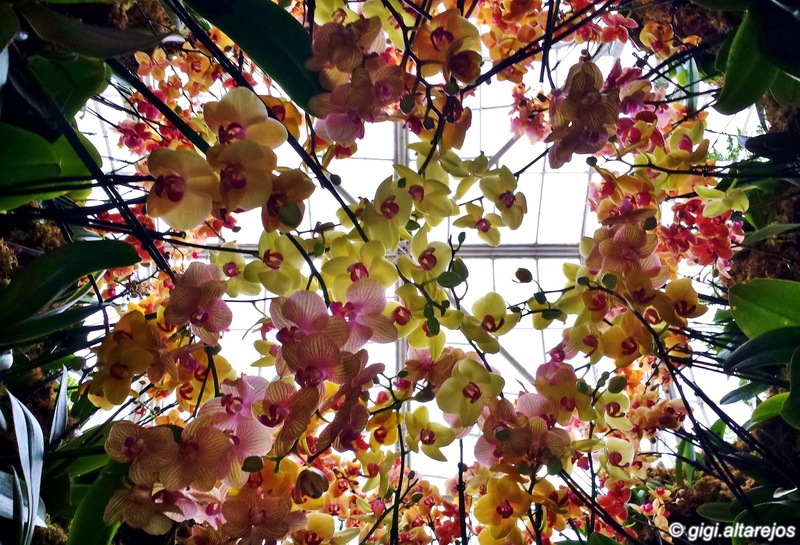 Standing under the center of the giant flower chandelier, I had this incredible view. I could stand here forever! It was a joy to see most of my favorite orchids. There's cymbidium in many different colors. I like this one, looks like an unusual color for an orchid. I love the moth orchids, some of them come in solid colors, some with stripes, others with spots, all beautiful. Mom's favorite has always been the anthurium. It is red and shaped like a heart, and seeing one always reminds me of her great love for us. 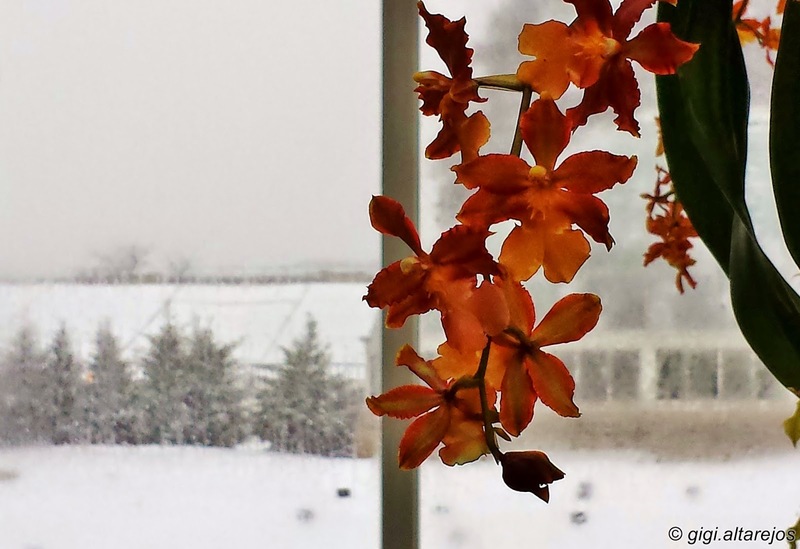 The weather outside was frightful but it was so delightful inside the Conservatory. The pretty dancing ladies made me forget the non-stop snow blowing outside. I hope seeing these pretty flowers have somehow chased your winter blues away. Thank you New York Botanical Garden, I had a wonderful time and enjoyed the Orchid Show. Now, we just need these flowers to call out to Mother Nature to let Spring come early this year. Everyone agree?